While visiting Tokyo be sure to make a visit to the amazingly well-stocked convenience stores. If I am out and about in the city I am sure to stop by a convenience store at least one, if not several times during the day. Usually for something to drink. The selection can be dizzying; coffee and tea – both hot and cold, fruit juices, pre-mixed cocktails, beer, and one cup saké just to name a few. Needing a small snack between meals? Onigiri (rice balls) stuffed with a variety of fillings like uméboshi (pickled apricots), nattō (fermented soybeans), or “sea chicken” (canned tuna with mayonnaise). There is an impressive selection of fresh vegetable salads – great to keep in mind as many travelers seem to be craving vegetables while in Japan. 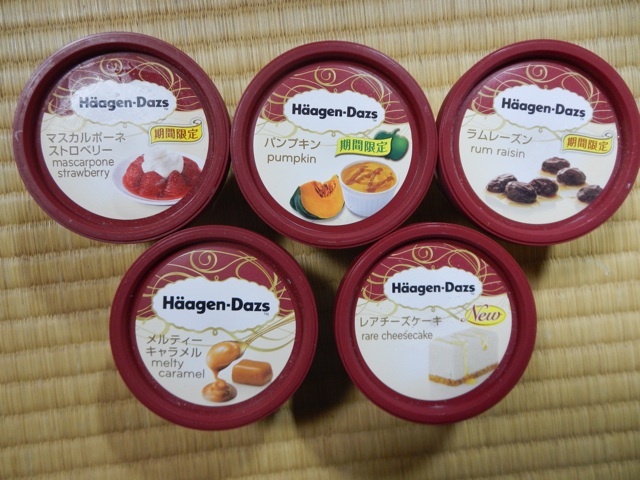 One thing worth making a special trip to the convenience store for is for the Haagen-Dazs mini cups. The flavors change throughout the year, so from time to time I like to see what’s in season. Currently select from rare cheesecake, melty caramel, strawberry marscapone, rum raisin, and pumpkin – Japanese kabocha pumpkin with a caramel sauce. Don’t dig in right away. Let it melt just a little bit for the best flavor and texture of the ice cream, as shown on this commercial. Hear hear! When our party of 10 arrived in Kyoto at 11pm, the convenience store was our sole dinner option. The rice balls were a godsend – everyone liked them, from the 7-year-old to the 72-year-old. And I’ve lost count of how many times I’d snuck in since, for delicious, slightly sweetened plain yoghurt, crunchy snacks and well-priced coffee (both hot and cold!). Yes! convenience stores have something for everyone – including hot and cold coffee!